Studio Ghibli is one of the most famous animation studios in the world, producing many films that continue to amaze and inspire people today. 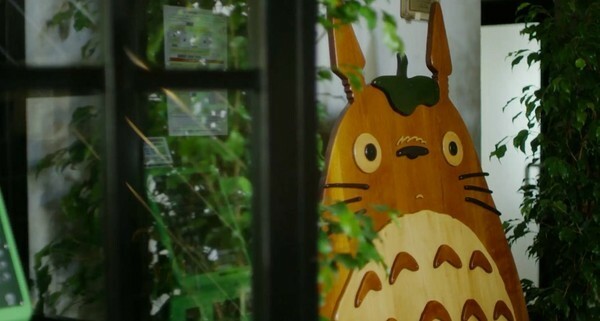 Although Hayao Miyazaki himself states that he prefers creating films for children, many adults can list at least one film by Studio Ghibli that they enjoy. Is this documentary therefore something that everyone can enjoy, or is it best watched by only those who consider themselves dedicated fans of Studio Ghibli’s works? Mami Sunada was allowed access to Studio Ghibli in order to observe Hayao Miyazaki as he worked on his final film, Kaze Tachinu (The Wind Rises), and producer Toshio Suzuki as he handled many different tasks. 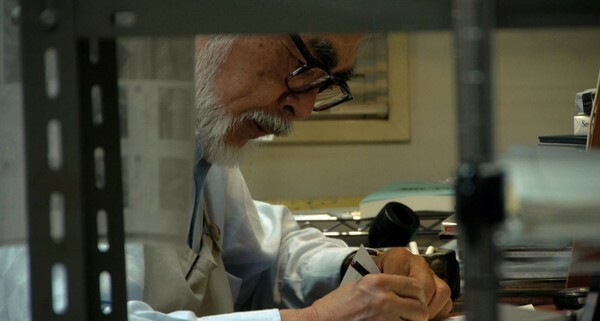 The Kingdom of Dreams and Madness is not solely a behind-the-scenes documentary of the film, however, nor does it focus entirely on the history of Studio Ghibli. It provides an insight into the mind of one of the world’s greatest creative geniuses and into the workplace of Studio Ghibli. 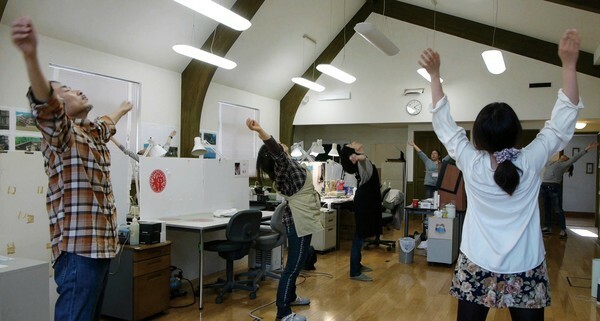 For example, we see Hayao Miyazaki and many Ghibli employees doing the popular Japanese radio calisthenics known as Rajio Taisou. 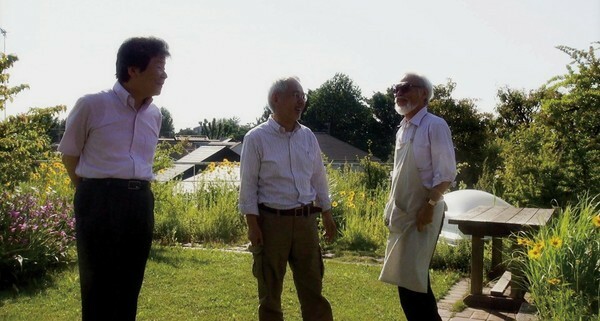 We see the interactions between Hayao Miyazaki and both those he works with and his friends. We get an insight into how the production was coming along with Isao Takahata’s film Kaguya-Hime no Monogatari (The Tale of Princess Kaguya) while this was being filmed. We witness an interview between Hayao Miyazaki’s son Goro Miyazaki and a producer in which we find out just how Goro feels about being a director and why he directed two films for Studio Ghibli. Mami Sunada here has managed to pack an immense amount of content into her documentary without causing it to drag on or feel too short. Throughout the documentary, we witness the lives that the people at Ghibli lead, the interactions they have with each other and Hayao Miyazaki’s philosophies about various things. We also get to see old footage and photographs of Hayao Miyazaki, Isao Takahata and Toshio Suzuki as they met and worked together on films in the past. 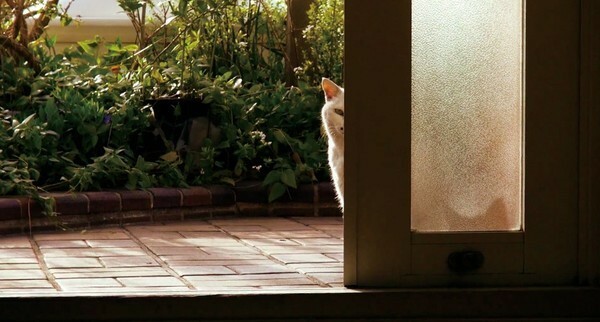 This documentary does not simply provide an insight into how Hayao Miyazaki works and what goes on at Studio Ghibli; it manages to get across many important messages about work and life and even shows us the relaxed life of Ushiko, the cat considered to be an ‘unofficial’ resident of Studio Ghibli. Where this documentary truly succeeds is in its presentation of the various aspects of Hayao Miyazaki’s life. We watch him creating storyboards and we listen to him talking about Isao Takahata, his father, his friends and Hideaki Anno, among others. We also hear some of his political opinions and his opinion on otaku, and we see his daily routine as well. He shows up to work at the same time each morning and leaves at the same time each night as well. During the day, he finds time to wave to the children at the on-site kindergarten and he never fails to keep up his daily schedule. We are given the privilege of seeing his home when he heads home at night and what he does with his spare time, such as making a photo album with pictures of ordinary things he took when actually setting out to document the impact of the Great Depression of 2008. This documentary gives us a rare and fascinating look at nearly every aspect of Hayao Miyazaki’s life. The visuals here are flawless. Not all posters seen throughout the documentary are subtitled, however notices in the building are, as well as the ending song of Kaze Tachinu, which can be heard on multiple occasions. There are no issues with the subtitles themselves, as expected from Studio Ghibli. End credits are left in their original Japanese with only a few credits translated into English in the subtitles. This is unfortunate, but not unusual. The shots of Hayao Miyazaki working, the rooftop of Studio Ghibli and the cat Ushiko for example are all fantastic with no issues whatsoever existing with the camerawork. 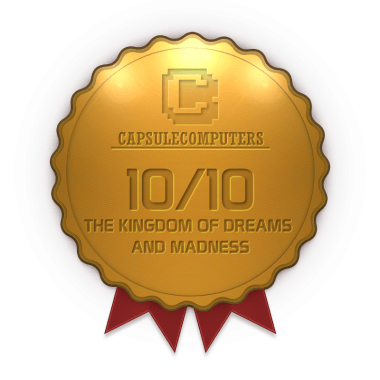 The only downside to Madman’s release is that it is DVD only, so anyone wishing to own a Blu-ray of the documentary may wish to purchase the region-free and English-subtitled Japanese release, available for 5,800 yen outside Japan. The audio with this release, as with the visuals, leaves nothing to be desired. Hideaki Anno is shown providing a sample of his voice after Hayao Miyazaki opens up to the idea of hiring him to be the voice of Kaze Tachinu’s protagonist Jiro Horikoshi. It is a ‘weird’ voice that Hayao Miyazaki himself stated would take some getting used to, but it seems to work. The music throughout the documentary, composed by Masakatsu Takagi, is excellent and perfectly suited to the shots it accompanies, even if it is not at the same level as Joe Hisaishi’s music is. This release comes with some fascinating on-disc extras. In addition to the theatrical trailer and a two-minute digest video, a 32-minute mini-documentary called ‘Ushiko Investigates!’ is included. While technically an extra, this can easily be seen as an extension of the documentary itself as it shows more of the production process. The main difference from the main feature is that it is told from the point-of-view of Ushiko via subtitles. This extra will undoubtedly be enjoyed by any fan wishing to see more of the behind-the-scenes work on Kaze Tachinu, which includes a discussion between Hayao Miyazaki and legendary composer Joe Hisaishi, as well as a live recording of one of the pieces of music he composed for the film. 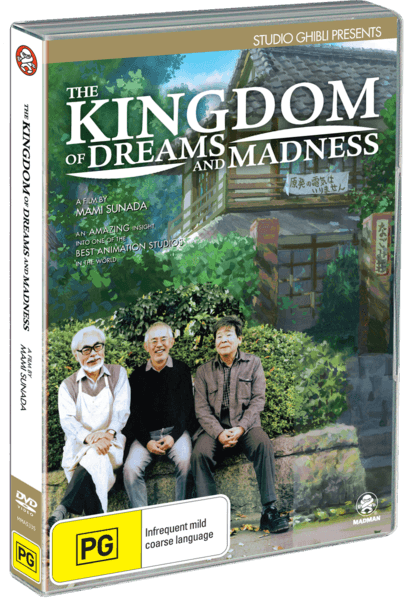 The Kingdom of Dreams and Madness is an engaging documentary about not only the production of Kaze Tachinu, but also about many different aspects of Hayao Miyazaki’s life and how he and Isao Takahata met. It provides an in-depth insight into the mind of the person who has created so many masterpieces that stand the test of time and discussions about Isao Takahata, a person who does not actually appear at the main building of Studio Ghibli very often. Anyone wanting to find out how a film is produced at Studio Ghibli or wanting to learn more about Hayao Miyazaki will not be disappointed with this documentary.